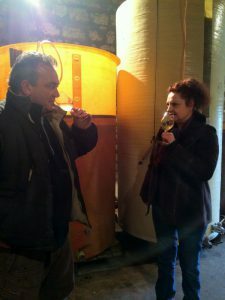 We have been drinking Laurent Lebled’s beautiful wines for a number of years on our trips to France and then a few years ago we finally got the opportunity to visit Laurent and his wife Sonya at their winery in the Loire where we able to arrange a shipment of the gorgeous Gamay called Ca C’est Bon and the 100% Sauvignon Blanc called La Sauvignonne. We enjoyed our time tasting through their range of wines which were accompanied by some stunning terrines and rillettes which went so well with their food-friendly wines. Now we have expanded the range of wines from Laurent that we are importing and are delighted with the quality of all of the wines that we import from him. This is the wine that we have been following for some years. We have come across it a number of times in fashionable wine bars and bottle shops in Paris on our perambulations through that wonderful city. We have always loved its juicy, gulpable qualities and the fine winemaking that sits behind it. 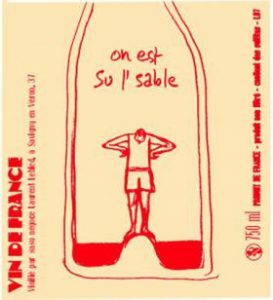 We have always loved the juicy, gulpable qualities of this smashable Gamay, made with carbonic maceration, which also has plenty of length. Some of this length comes from the rocky soils that the Gamay vines grow in and further complexity is the result of the carefully selected (selection massale) vines that were planted in 1950 and 1970 and are therefore at the peak of their maturity. This wine is an entry level Sauvignon that has been treated with great respect during the winemaking process. The small plot of vines grow in clay and limestone soils Laurent will never release a wine that he is not happy with. In fact, we had to convince him that we treated his wines well in bringing them to Australia. We were able to explain that there was complete traceabilty of our wines from the moment they were picked up at the winery until they arrived in our temperature-controlled warehouse in Australia. This Sauvignon Blanc has been produced from organically-grown grapes which macerate for some time (between 7 and 12 days) in large concrete tanks with a twist! The concrete tank has a raised chestnut wood floor through which any juice that comes out of the grapes passes to the floor of concrete below thus is not in contact with the skins. This reduces the effect of the long maceration, before being pressed and then fermented naturally so that the wine retains the true flavour of the Sauvignon Blanc grape rather than the “tropical” flavours introduced via commercial yeasts. This is a lovely macerated wine at a very reasonable price considering the quality of the winemaking skill involved. 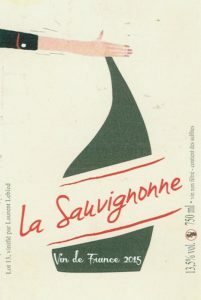 As the name implies, this wine is made from Cabernet Franc grapes that have been grown in a sandy vineyard near Chinon. 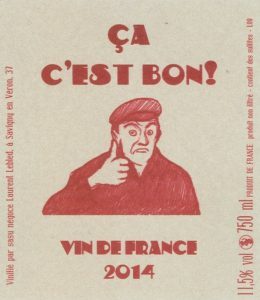 It has none of the harsh aspects that Cabernet Franc can display in the wrong hands. Laurent understands this grape well and coaxes a suppleness, fruitiness and juiciness from this grape to make this fine, gulpable wines. The grapes are harvested manually in small crates. The grapes then undergo carbonic maceration for up to 30 days in cement tanks. The grapes are then pressed in a screw press before completing the fermentation in large fibreglass tanks. The wine is neither fined nor filtered. The wine is light enough to accompany chicken or quail or a range of charcuterie while being complex enough to pair with grilled meats. This wine is from grapes cultivated in the Touraine appellation in the Loire Valley on clay and limestone soils. 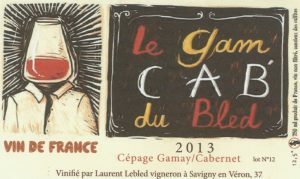 It is a blend of Cabernet Franc and Gamay (the appellation requires winemakers to blend their grapes). The Cabernet Franc is de-stemmed and then macerated from between 17 to 20 days. The Gamay undergoes carbonic maceration for a similar period. The combined juice therefore has a combination of structure from the Cabernet Franc and juiciness from the Gamay. This wine has very fine tannins and is quite gulpable!